The Republic of the Maldives is an archipelago in the Indian Ocean and a part of Southern Asia. 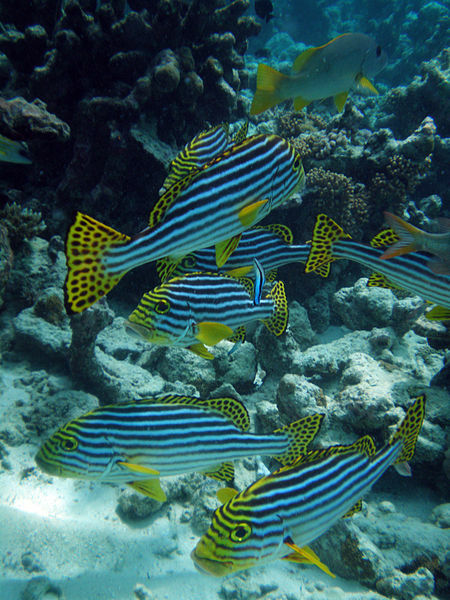 It consists of 1192 coral islands grouped into a double chain of 26 coral atolls. Only about 200 islands are inhabited, with tourist resorts in other 80 islands. It is the smallest Asian country, both in population and land area, and is the lowest country on earth. The highest point in Maldives is only 2.4 meters, while the average ground level of is just 1.5 meters above sea level. In places where construction exists, this level has been increased to several meters. Most of the land in Maldives (more than 80 per cent), is composed of coral islands rising less than 1 m above the sea level. The satellite data shows 3.3 ± 0.4 mm per year rise in the global average sea levels around the world. The forecast of inundation of Maldives is causing great concern for the people around the world in general and the people of Maldives in particular. The islands of Maldives are spread over roughly 90,000 square km along the direction of north to south. 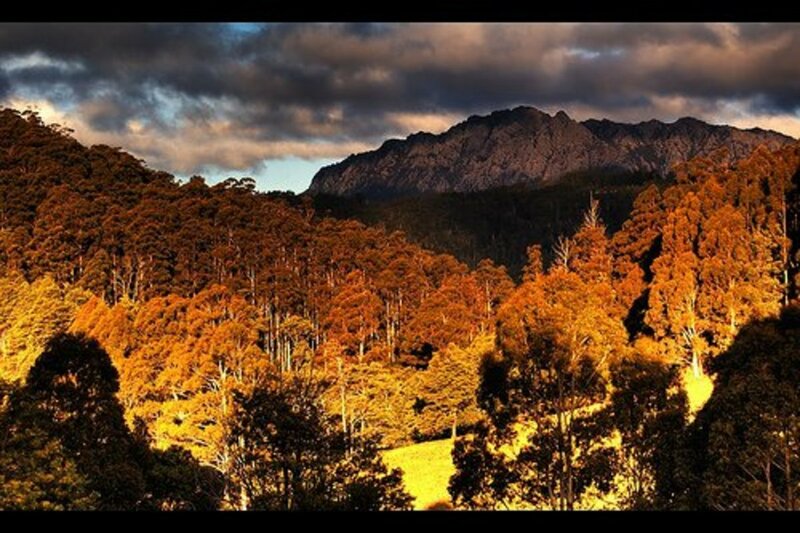 It is one of the most dispersed countries in the world. It lies between 1°S to 8°N, and 72° to 74°E. The atolls of Maldives are composed of sand bars and live coral reefs, situated atop a 960 km long submerged ridge, that rise abruptly from the depths of the Indian Ocean, and run from north to south. 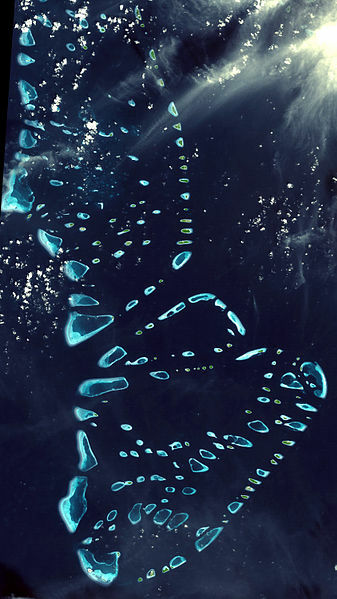 Through the southern end of natural coral barricades, there are two open passages, one from the side of the Indian ocean and the second through the territorial waters of Maldives. These passages permit the safe ship navigation passage for the ships. The government of Maldives has divided the atolls into 21 administrative divisions.The largest island is Gan, which belongs to the Laamu atoll. The westernmost islands on Addu atoll are connected by 14 Km long road built over the reef. 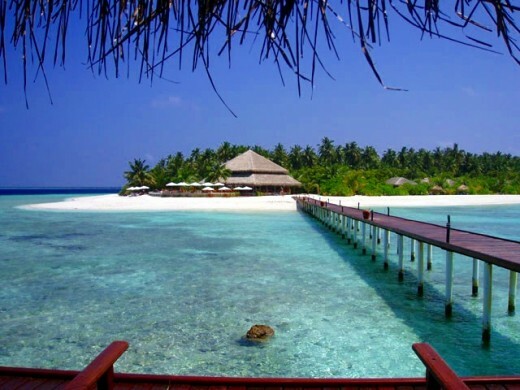 The climate of Maldives is tropical, with enough sunshine and an average annual temperature is about 30°C. The rainfall increases during the months of April and October. The average annual rainfall is 254 cm in north and 381 cm in the south. The large landmass of South Asia present to the north affects the weather of Maldives by causing the differential heating of land and water. This heating brings moisture-rich air from the Indian ocean to South Asia, and the monsoons occur. These southwest monsoons, come from June to August. But the weather of Maldives does not always follow the South-Asian monsoon patterns. The weather of Maldives has two seasons. The first is dry season associated with the north-east monsoon in winter, and the second is the rainy season of storms and strong winds. During April and May, the shift from the moist southwest monsoon to the dry northeast monsoon occurs. Hence the northeast winds from the northeast monsoon, which reaches Maldives in the beginning of June and lasts until the end of August. The history of Maldives has mostly been an independent polity. There are only three instances when the country was ruled by foreigners. First, it was just for 15 years in the middle of 15th century, that the Portuguese dominated the land. Secondly, the Dutch ruled Maldives in the second half of 17th century, but only for four months. Finally on the brink of war, the British got hold of Maldives. It remained a British protectorate from 1887 to 1965. The name Maldive Islands, for the islands, was given by the British, and later it became Maldives. 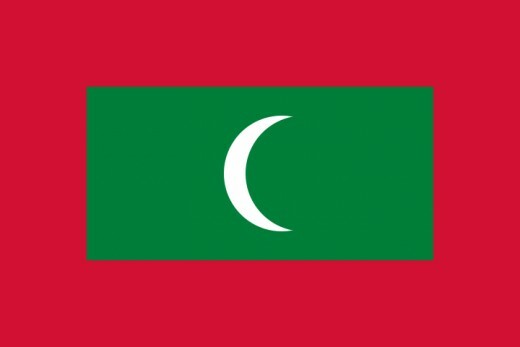 In 1965 Maldives gained independence from the British. It became a republic, 968 ruled by an authoritarian government and the president. 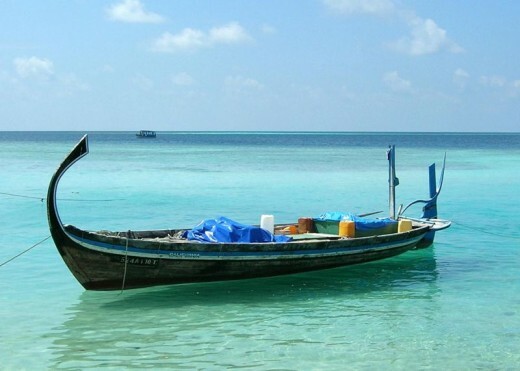 The first settlers in Maldives were the Dravidian fishermen from Kerala (India), during 300 BC to 300 AD, and Sinhalese people from western Sri Lanka. That is why a strong Dravidian culture survives in Maldives in the form of language, poetry, place names, dance traditions, religious beliefs and kinship names making the islands as an extension of Indian archipelago. 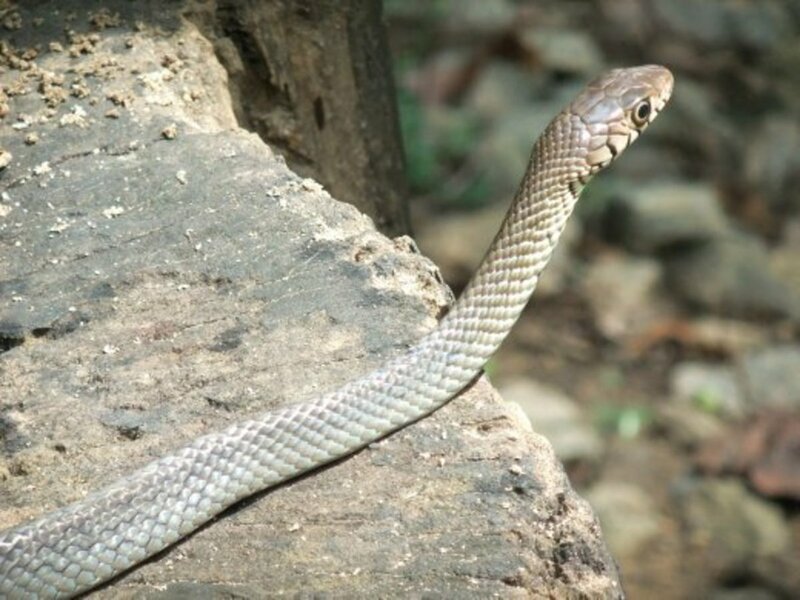 It spread to the islands during the time of Indian Emperor Asoka the great. Until the 12th century AD, the people of Maldives remained Buddhists and the ancient Kings promoted the religion. The first writings, architecture, sculpture and aesthetic achievements of the island belong to this period. The Buddhist stupas are found on many atolls of Maldives. Earlier the people practiced ancient Hindu traditions and venerated the Sun God. The northern atolls became the part of Chola Empire of south India in early 11th century. Koimala, from Sri Lanka, freed Maldives from Tamil Chola rule in the early 12th century AD and established a kingdom. Many foreign travelers, particularly the Arabs, mention the kingdom of Maldives being ruled over by queens. One Yusuf Tabrizi, an Iranian converted Maldives to Islam in 12th century AD. The Moroccan traveler, Ibn Battuta, visited the place in the 14th century. 400 kilometres south-west of India. The British responsibility for defense and external affairs of the Maldives ended on 26 July 1965, by an agreement signed by Prime Minister, Ibrahim Nasir on behalf of Sultan, and the British Ambassador to the Maldives. This gave full political independence to Maldives. Mohd. Fareed Didi declared himself King rather instead of Sultan, and the sultanate continued for another three years. In 1967, the parliament voted in favor of a republic. 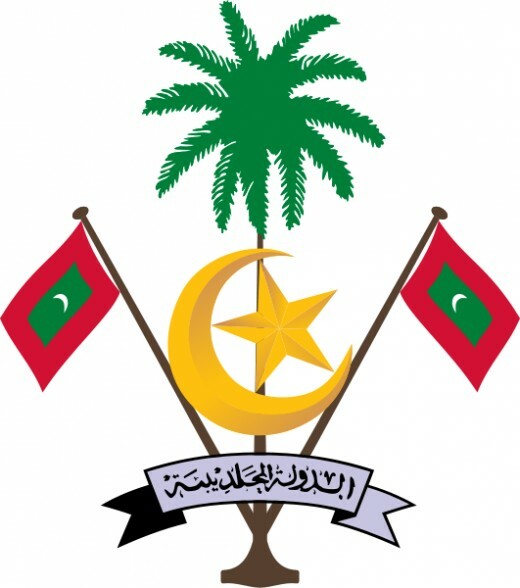 In a national referendum held in 1968, the people too voted in favor of a republic.Maldives was declared a republic on 11 November 1968, by ending the 853-year-old monarchy. Ibrahim Nasir became the Prime Minister with little power to the king. Due to political infighting, Nasir fled to Singapore in 1978 by taking millions of dollars from the treasury. From 1978, Mohd. Abdul Gayoom, ruled for 30 years, as a President. He became the dictator by rigging the elections for six consecutive terms. In 2003-4, the resistance to his rule caused riotings. Free and fair elections were finally held in 2008, under international pressure. Gayoom conceded defeat to Mohamed Nasheed, who too was forced to resign on February 7, 2012, following the protests which started on May 1, 2011. Now Mohammed Waheed Hassan, who is backed by the former dictator, is the president of the Maldives.Next elections are scheduled to be held in July 2013. Following the earthquake in the Indian ocean, the islands of Maldives were devastated by the tsunami. Just 9 islands escaped any flooding, 57 islands were seriously damaged, 14 islands had to be evacuated totally, 6 islands were completely destroyed, 21 island resort were forced to close down. The total estimated damage was more than the US $480 million. About 102 locals and 6 foreigners reportedly died in the tsunami. The Tsunami caused great damage to the Maldives. One-third of the population was directly affected by it, which left more than 15,000 people homeless. 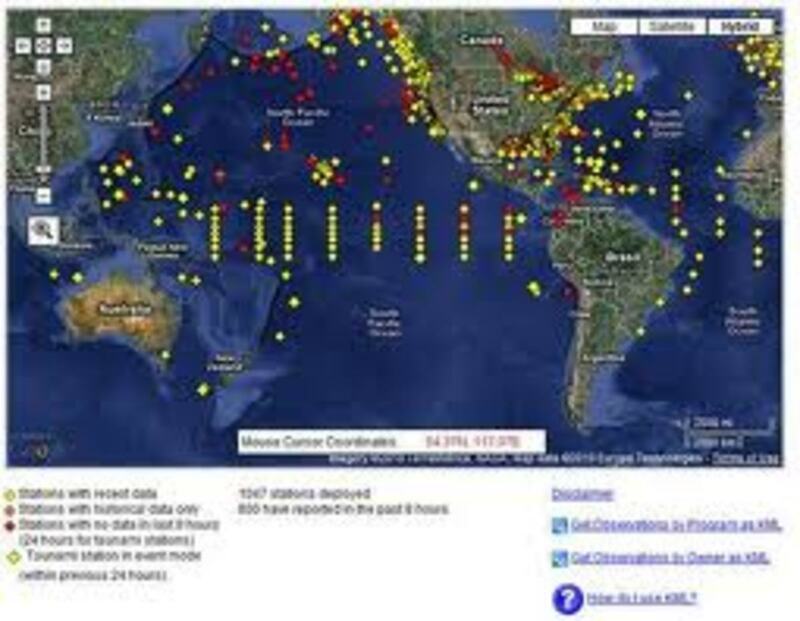 The destructive impact of the tsunami on the low-lying islands was mitigated, because the waves could not gain height, from the hindrance of the continental shelf or land mass. 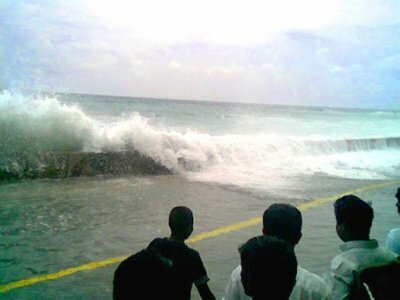 About 14 feet high waves were reported to strike the coasts of Maldives. The international donors and other agencies accumulated more than the US $400 million for rehabilitation and aid. This was used to help the displaced persons to rebuild their homes and infrastructure. 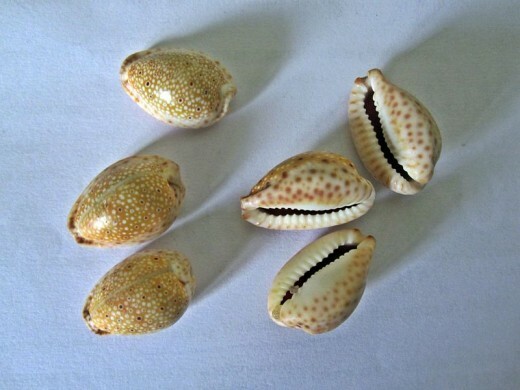 The language and culture of Maldives shows the influences of Sri Lanka and south India. The Arabic influence is due to Islamisation and the location of Maldives at the crossroads in Indian Ocean, which was the trade route between far east and the middle east. The population is mainly Indo-Aryan,while the language has Indo-Iranian-Sanskrit origin. There are few elements of African influence too. After the Hajj journey to Arabia, the royal family and the nobles brought slaves with them. Like the ancient Dravidian culture, the marriages have a strong matriarchal traditions. Due to marriages at early age, the divorce rate in society is very high. The people are almost entirely the Sunni Muslim. The use of alcohol, pork, dogs and public observance of non-Muslim rites is banned in the inhabited islands.Anything can go in the resort islands. The looks and dialects of the people of Maldives, differ from one atoll to the another. The synthesis of cultures is very evident in arts, as in the southeast Asian architecture of intricate details on wooden beams of antique mosques.The local bodu-beru (big musical drum) resemble the African drum. The dhoni (a sailboat) is an art in itself. The undefined but distinct geometric designs in mats, the embroidered neckline in the traditional dresses of women, the ornaments etc., are quite aesthetic. The people are open to adaptation and welcome the inspirations. The tourism industry, earns about 20% of GDP and 60% of the foreign exchange, while the other 20% of GDP comes from garment sector, boat building, handicrafts etc. The import duties and tourism-related taxes contribute for 90% of government revenue. The second leading sector is fishing. The agriculture and manufacturing are the minor sectors in economy, due to limited land and the labor scarcity. Curries are most important in the local cuisine, which is cooked with diced and fresh tuna fish, known as mas riha. The chicken curry or Kukulhu riha takes different spices for flavor. The ingredients of vegetable curries are eggplant, pumpkin, unripe bananas and certain leaves etc. The fish is generally added to give extra flavor to the vegetable curry. The curries are taken with steamed rice. Fish is never eaten raw. 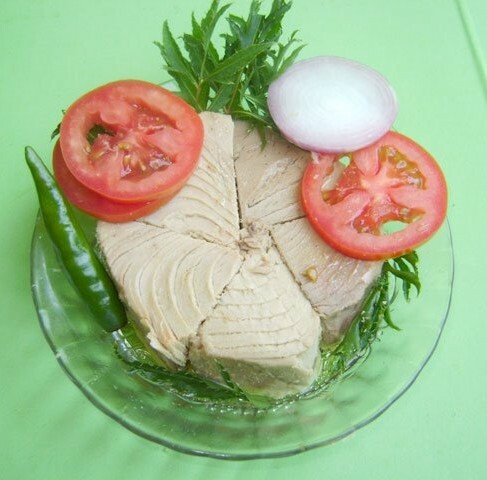 The pieces of tuna fish are used to make curries. The raw or processed tuna is cut into thumb size pieces. 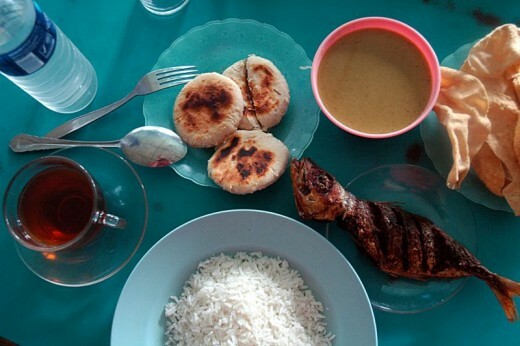 In Maldivian cuisine, the tuna based thick brown paste, called rihaakuru is an essential item. Starches like rice is either eaten boiled or ground. The tubers like sweet potato, and fruits like breadfruit etc., are eaten after boiling, while the screw-pine fruit is cut into pieces and eaten raw. Coconuts are used in the grated form in mas huni, or squeezed to obtain the milk, or as an oil in dishes for frying. Coconut milk is an essential ingredient in curries and dishes. The dishes are generally hot, spicy, coconut flavored, with very few vegetables used in it. The traditional meal consists of rice, chilies, clear fish broth, onions and side dishes of lime. mas huni, the shredded and smoked fish with grated coconuts and onions for breakfast. fihunu mas, the barbequed fish basted with red chilies. bambukeylu hiti, the curry made with breadfruit. bajiya, the pastry stuffed with fish, coconuts, onions etc. gulha, the smoked fish stuffed into the pastry balls. keemia, the deep fried fish rolls. kulhi borkibaa, the spicy fish cake. masroshi, the baked mas huni wrapped in roshi bread. theluli mas, the fish fried in chilies and garlic. Thank you suzettenaples, for the interest and comment. Thanks Radhikasree. 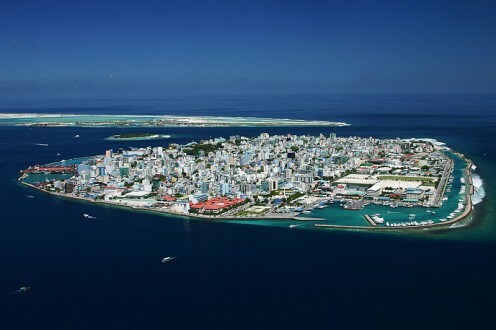 I am afraid that by the end of present decade, half of the Maldives would get submerged due to rising sea level. Maldives is an eternal tourist destination that many would dream to visit. Thanks for sharing. Voted up and interesting. Very interesting and informative article. I have always had an interest in the Maldives - they are gorgeous islands that I would like to visit someday. I have learned much from this article about them. Thanks for sharing your knowledge. Voted up and sharing.